Encourage active play with our wooden push toy Bunny. Handmade in Des Moines, IA, it features an interior cutout that makes an easy "handle" for little fingers to grasp. Fun for babies and toddlers alike, this toy helps to develop motor skills and hand-eye coordination. Crafted from locally sourced Cherry wood, it is finished with a mix of beeswax and flaxseed oil. 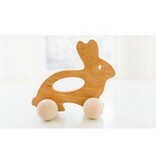 The bunny is approximately 5" x 6", with wheels that are fully functional.